The special properties of topological materials typically occur at their surface. These materials, for example insulators that do conduct current at their surface, are expected to play a major role in future quantum computers. Scientists of the University of Twente and the University of Amsterdam now demonstrate a new property: the non-superconducting material bismuth shows lossless current conduction. What's even more special: it doesn't just occur at the surface but on the inside of the material as well. The scientists publish their findings in Nature Materials. Topological materials have drawn increasing interest, especially after Thouless, Haldane and Kosterlitz won the Nobel Prize in Physics in 2016. These materials get their particular properties by playing with the order of energy levels. By 'twisting' these levels, a material that doesn't conduct any current under normal circumstances will suddenly become a conductor, but only at its surface. The phenomenon includes the transport of electrons and their spin – this describes the way the electron spins on its own axis and its magnetic properties. In their Nature Materials paper, the researchers now demonstrate a that the transport and spin of electrons are related,in a topological material. Thanks to this property, a non-superconducting material will even be able to conduct current without resistance. Majorana quasiparticles play a major role in this. Notably, this is not a property that can only be observed at the surface. Measurements show that superconduction also takes place inside the bulk of the material. This makes the properties less vulnerable to noise or pollution, for example. Bismuth with a little antimony has become a model material for studying electronic properties. In bismuth, the number of electrons available for conduction is so low that it can hardly be called a metal. But the electrons in this 'semimetal' do move like particles at the speed of light. 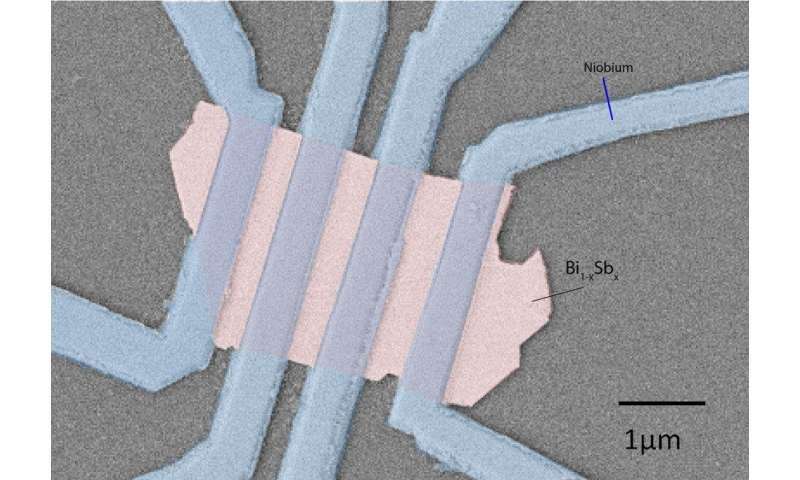 Applying superconducting electrodes made of niobium to a thin crystal flake of bismuth doped with antimony at a temperature of 10 milli Kelvin causes a superconducting current to flow through the material. In a superconductor, paired electrons, so-called Cooper pairs, are responsible for conduction. This is not the mechanism inside the bismuth: Here, Majorana particles are responsible. This is confusing because it seems to redefine a superconductor. Conventionally, a superconductor is simply something which conducts electricity without resistance, which this purports to do. Cooper pairs were discovered long after superconductors. Are other properties also different? Is this diamagnetic? Is there a critical temperature and a critical field?